Award-winning designer chocolatier and chef, Phillip Ashley is the President and CEO of Phillip Ashley Chocolates. He has developed an international following for his wildly imaginative chocolates. High profile clients, A-list celebrities and major corporations select the brand for gifts. Phillip Ashley is considered the preeminent chef of luxury chocolate. He is listed as one of the Best Chocolatiers and Confectioners in America by TasteTV. FORBES Magazine hailed him as the “Real Life Willy Wonka” and his brand has been selected as a Top Pick by Vogue Magazine. 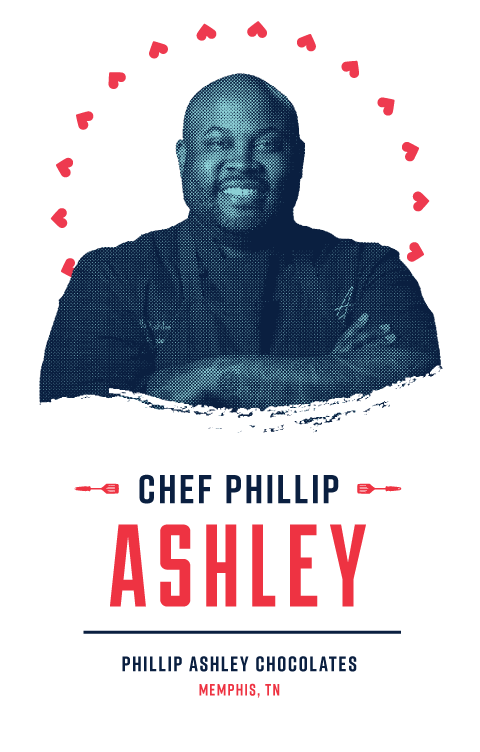 A self taught chocolatier, Phillip Ashley has been a featured executive chef at the esteemed James Beard House in New York City and the official chocolatier of the 58th GRAMMY® Awards and 69th Emmy® Awards Governors Ball. Phillip Ashley Chocolates are available worldwide via its online store and are sold by national luxury retailers: Neiman Marcus and Horchow.